Sting.com fan club members should log-in as a member to access the promo code for purchase. Not a member of Sting.com but interested in joining for access to exclusive members-only contests, ticket pre-sales, behind-the-scenes content and more? Visit the Sign up page. “An Evening with Sting: Symphonicities” is a one-night-only gala benefit featuring many of Sting's most celebrated hits reimagined for symphonic arrangement. The concert marks his first time headlining a full performance at Carnegie Hall. Performing with the Orchestra of St. Luke’s conducted by Rob Mathes, Sting will also be joined by a quintet featuring Dominic Miller (guitar), Jo Lawry (vocals), Ira Coleman (bass), Joe Bonadio (percussion), and Mike Ricchiuti (keyboards). Concert-only tickets will go on sale to the general public on Monday, August 24 at 8AM/EST. MasterCard cardholders may purchase tickets beginning Friday, August 21 at 11AM/EST. Please visit CarnegieHall.org/Sting for details. Gala benefit tickets are still available and include prime concert seating as well as admission to either a pre-concert cocktail reception at Carnegie Hall’s Rohatyn Room ($1,000) or the post-concert dinner at The Plaza (tickets starting at $2,500). 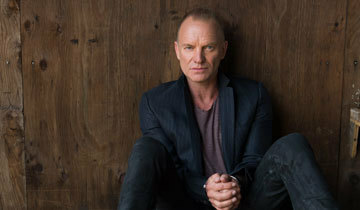 Tickets may be purchased by calling the Special Events office at 212-903-9679 or visiting online atCarnegieHall.org/Sting. All proceeds will benefit Carnegie Hall’s artistic and music education programs. Lorde, Elbow, Sting, Of Monsters and Men, Kate Bush, Peter Gabriel and other artists have all expressed their support for the Dalai Lama by contributing songs to a compilation album entitled Art of Peace: Songs for Tibet II that has been released on iTunes today.The songs represent a celebration of the Dalai Lama’s philosophy of compassion and non-violence and peace. It is designed to focus people’s attention on the global significance of his teachings and the gift of Tibetan culture. Proceeds from the album will be used to help improve economic conditions for Tibetan refugees and facilitate cultural preservation projects.